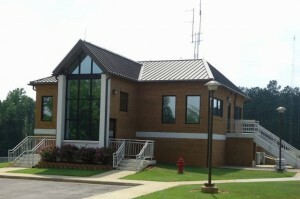 Board meetings are held at the Warrior River Water Authority offices located at 8900 Lock 17 Road, Bessemer, AL 35023. Meetings are scheduled for the first Tuesday of each month at 6:30 PM. Check back here for any date or time changes. As a Board and staff, we wanted to take this opportunity to update you on recent events within the water system and let you know about future events as well. Since 2010, the Board has expended over $14 million in capital improvements. This work is part of a long range capital plan that is spread over multiple phases and years. Projects completed so far have targeted new EPA and ADEM requirements, well refurbishment, improving overall treatment reliability, and treatment plant upgrades. Within the distribution system, work has focused on increasing the overall distribution capacity from the plant with larger transmission mains and improving the level of service to existing customers by replacing older leaking, break prone PVC water mains. We are proud to say that projects completed thus far have been completed within budget. Financing for these projects has been through low interest loans, refinancing of existing debt, and savings realized from increased efficiencies in overall system operations. Work is continuing and the Board expects several major projects to be completed in 2017. Several events have occurred in 2016 that have not only reinforced the Board’s decision 7 years ago to proceed with these improvements but have also highlighted the results of these efforts. Central Alabama is currently experiencing an extreme drought. Several water systems in Alabama have been forced to implement water rationing because water supplies have been insufficient to keep up with customer demands. Through careful management of our water supply resources, the WRWA system has endured this drought without having to impose surcharges or water rationing requirements on our customers. The ample supply of water to our customers has been a direct result of our efforts over the last 7 years. The final component of the Board’s mission is to provide service at a reasonable price. A critical part of meeting this mission is the active management of the Board’s financing and the rates charged to its customers. Board spending is governed by a budget adopted each fiscal year. Actual versus budgeted spending is tracked continuously and reviewed monthly. The Board also reviews and adjusts its rates annually as required to meet the anticipated needs of the system. January, 2017 will mark the third anniversary of the last rate adjustment to the WRWA rate structure. The annual rate review has recently been completed. Based on the anticipated needs of the system, the Board has adopted a change to the rate structure that will become effective in 2017. Beginning in January, WRWA’s rate structure will be modified to reduce the amount of water in the minimum bill bracket from 1000 gallons per month to 500 gallons per month. In January, 2018, the minimum bill bracket will be eliminated and an availability charge will be applied to all accounts and customers will be charged for all water consumed at the Board’s standard rate. No changes have been made to the Board’s per 1000 gallon charges for water provided. For a typical customer, this will result in an increase of $3.32 per month for 2017. We look forward to serving you in the future. If you have any questions concerning this or your water service in general, we encourage you to call our office at 205-491-7720 or email us at wrwa@warriorriverwater.com. While you’re carefully watching your water usage, it’s important to make sure that water is not slipping away due to undetected leaks in your system. Here’s a simple procedure that can tell you if you have a leak and how much water you’re losing. Locate your water meter. It is usually located near the street in front of your home. Read the meter twice – first at night after the day’s water use has ended, and again in the morning before any water is used. Subtract the first number from the second reading to tell how much water (if any) leaked out overnight. If you suspect a leak, your pipes and connections should be checked and repaired quickly. The toilet is a common source of unnoticed leaks. Undetected, hundreds of gallons of water can be wasted each day. Often leaks occur when the toilet is out of adjustment or parts are worn. Listening carefully for the sound of running water is a good way to detect a possible leak. Food coloring or a dye tablet added to the tank will also reveal water leaking into the toilet bowl. Drop it in the tank and don’t flush. If the water in the bowl turns color, you have a leak. If you suspect a leak and need assistance in determining its location, please call our local office. Check to see if the linkage that connects to the trip lever is hung up. If that doesn’t work, then the ball needs to be replaced. 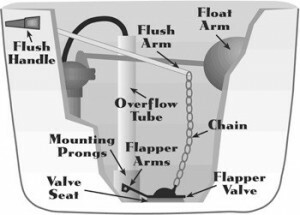 A flapper ball can replace a worn flush valve ball. The ball has a leak and is full of water. Replace with another ball or flapper. The float ball needs adjusting. Use the screw at the base of the rod to lower the float ball so that the water level is 1/2 to 1 inch below the overflow tube. If water does not shut off when you lift up on the float ball, then the valve itself needs to be repaired or replaced. Repair kits and new valves with easy to follow instructions are available at local hardware stores. If worn, replace the flush ball or flapper. Switching to an ultra-low flush toilet is an effective way to make your home or office more water efficient. Ultra-low flush (ULF) toilets use no more than 1.6 gallons per flush (gpf) rather than 3.5 to 7 gallons of water used by other designs. That’s why new plumbing codes are requiring ULF toilets to be installed in all new construction, bathroom remodels and additions and toilet replacements. What are ultra-low-flush toilets? ULF toilets look similar to conventional toilets but use a more advanced flushing mechanism. ULFs use only 1.6 gallons per flush (gpf), or less, compared to standard toilets that use 5-7 gpf or “water-conserving” models that use 3.5 gpf. Are ULFs more dependable than the 3.5-gpf “water-conserving” models? ULF toilets have been completely redesigned to go below 3.5 gpf and work more efficiently. How much water can I save by switching to a ULF toilet? A household of four people with a standard five-gallon-per-flush toilet would save approximately 60 gallons per day or about 22,000 gallons per year. Do ULF toilets cost more? As with other toilets, ULFs come in a broad range of prices. Many models are available for about $100 and can run as high as $400 or more for the decorator models. Are these toilets available in many colors and styles? Yes. ULF toilets can be purchased in the same spectrum of decorator colors as conventional toilets. Various styles are available in plain rim, elongated rim, and high handicapped models. Do the ULF toilets install like conventional toilets? Yes. ULF toilets install just like conventional toilets, making them ideal for remodeling and new construction. No special hook-ups or tools are needed. Will I ever need to double-flush to wash away waste? Double-flushing is seldom needed. When it is, two flushes use less water than a conventional toilet uses in one flush. Regarding the flow of waste through sewer pipes, ULFs must meet the same stringent drain line carry requirements as conventional toilets. Also, water from showers, bathtubs, and sinks helps keep your sewer pipes open. Do these toilets require more cleaning than conventional toilets? No. The flushing action washes the bowl quickly and efficiently. Occasionally, toilets with a small water surface (4-inch by 5-inch versus 8-inch by 9-inch) may require slightly more cleaning than other types. How do I know if the toilet I’m buying works the best? New performance standards and testing criteria were released by the American National Standards Institute (ANSI) in December 1990. All ULF toilets have to meet these standards to be listed by the International Association of Plumbing and Mechanical Officials (IAPMO). How Low-Flush Toilets Work Ultra-low-flush toilets use an efficient bowl design and increased flushing velocities to remove waste, rather than simply using large amounts of water for flushing. The Pressurized Flush This is a new design developed for 1.6-gpf residential toilets. It uses the house water line pressure to increase the velocity of the water going into the bowl. Within the toilet tank, incoming water presses against a rubber diaphragm that compresses a pocket of air. The water is released by pushing the flush valve. The Gravity Flush This technology is also used for conventional toilets. When flushing an ULF toilet, however, the rim wash can come through an open slot rather than through little holes. The bowl may have steep sides and a narrower trap way. These changes to the design of the toilet bowl cause a quick release of water, creating a siphon action to pull the waste out. Waste water may be the simplest way to stretch your water budget during the hot summer months. Gray water, which is recycled shower, bath, and laundry water, can be used to keep thirsty plants alive, but some precautions should be followed. Because gray water has not been disinfected, it could be contaminated. A careful, common-sense approach to the use of gray water, however, can virtually eliminate any potential hazard. Never use gray water for direct consumption. Gray water should not be used directly on anything that may be eaten. Gray water should not be sprayed, allowed to puddle, or run off property. Use only water from clothes washing, bathing, or the bathroom sink. Do not use water that has come in contact with soiled diapers, meat or poultry, or anyone with an infectious disease. Plant specialists warn that gray water should not be used on vegetables, seedlings, container plants, or acid-loving plants such as azaleas, begonias, camellias, and citrus trees. Gray water should be rotated with fresh water to leach out any harmful build-up. Chlorine bleach may damage plants, especially if it touches the foliage. Biodegradable soaps appear to have the least harmful effects. For further information regarding the safe use of gray water, contact your local office or your local health agency. Check for and repair leaky hose connections and sprinkler valves. Small leaks can be very wasteful. Water in the cool parts of the day to cut down on evaporation. Add compost to your soil to improve its water-holding capacity. Ask your nursery person about low-water-using turf, and raise your lawnmower cutting height. Longer grass blades help shade each other and cut down on evaporation. Don’t over-water – water only when the soil is dry. Water trees and shrubs – which have deep root systems – longer and less frequently than shallow-rooted plants, which require smaller amounts of water or more often. When planting, remember that smaller-size container plants require less water to become established.